Kevin Costner and his band Modern West will be playing the Spencerville fair Saturday, September 10th. Tickets at the door are $37. For a hundred bucks some lucky fans at this small town fair will certainly be in a ...field of dreams .... having wine and cheese with Kevin prior to the show. Spencerville is just to the south-west of Ottawa down the 416. 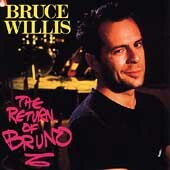 On the subject of movie stars putting out music, do you remember The Return of Bruno? The debut album by Bruce Willis released by Motown in 1987. Features R&B covers sung by Willis, with backing musicians including Booker T Jones and The Temptations.